It is pleasing to see a family who immigrated, bought a home and then kept that home through several generations. Such is the case of William Hingston who lived in the same house his entire life. William Robert Hingston was born on 29 January 1889 in Peabody, Essex County, Massachusettes. He was the third of six children of Freke W. and Anna (Smythe) Hingston. Freke was an immigrant from Ireland and Anna was an immigrant from England. James Edward, born July 1890. Joseph Freke, born November 1894. The 1900 Census finds the widow Hingston heading a household consisting of her five living children. Sixteen-year-old Ellen is working as a suspender maker. William, James, and Joseph are attending school while 4-year-old Florence is at home. Also living with them at 250 Washington Street, Peabody, MA are two boarders, Richard Daley, Age 28, and Patrick W. Driscoll, age 27. The 1910 Census finds the widow Hingston heading the household consisting of her and her five living children. Mary is a bleacher at a bleachery, William is a machinist at a machine shop, James is a carpenter who was out of work 20 weeks during the previous year. Fifteen-year-old Joseph is both working as a bleacher at a bleachery and attending school. Florence is attending school. A “bleachery” is a place where people bleach cloth or clothing. February 1914 was a busy time for William. On February 4th, William initiated as an apprentice in Freemasonry. On February 24th, he married Florence Reid in Peabody in a ceremony performed by Allen Greene, a clergyman. It was the first marriage for both. William continued with his Masonic activities being passed to Journeyman on 11 March 1914 and raised to Master Mason on 8 April 1914. Barbara Reid Hingston – 11 Sep 1914. Priscilla Ann Hingston – 12 Jan 1923. Allen R Hingston – January 1926. In 1919 William was made a regular officer in the Peabody Police Department and William stopped being a machinist. In 1920, the Census showed William and Florence living with their oldest daughter, Barbara, at 250 Washington St., Peabody, MA. William is a police officer for the city of Peabody. In 1930, the Census showed William and Florence with all three of their children. Barbara and Priscilla are attending school, while Allen is still too young to be going to school. They are still at 250 Washington St. The 1940 Census indicates that Barbara has left home, but Priscilla and Allen are still home and attending school. The Census also shows that William had an 8th-grade education. William registered for the draft on 26 April 1942. His physical description was entered as Height 5′ 10½”, 232 lbs, Gray hair blue eyes, light complexion. He was a big man. We see a photo of him in a June 1942 newspaper showing his size. In July 1953, while on duty, William was struck by a car. His injuries forced him to retire the following January. He died the next month, on February 24th at home. I have not been successful determining where he was interned. Find William Robert Hingston’s burial information. 1900 Census, 1900 Census – Annie Hingston – Peabody, Esses, MA (FS). “United States Census, 1900,” database with images, FamilySearch (https://familysearch.org/ark:/61903/1:1:M9R8­841 : accessed 12 March 2018), William R Hingston in household of Annie Hingston, Precinct 1 (east half) Peabody town, Essex, Massachusetts, United States; citing enumeration district (ED) 430, sheet 19A, family 423, NARA microfilm publication T623 (Washington, D.C.: National Archives and Records Administration, 1972. ); FHL microfilm 1,240,647. https://www.familysearch.org/ark:/61903/1:1:M9R8-84. 1910 Census, Annie Hingston, Peabody, Esses, MA (FS). “United States Census, 1910,” database with images, FamilySearch (https://familysearch.org/ark:/61903/1:1:M2JN­FF1 : accessed 12 March 2018), William R Hingston in household of Annie Hingston, Peabody, Essex, Massachusetts, United States; citing enumeration district (ED) ED 443, sheet 30A, family 479, NARA microfilm publication T624 (Washington D.C.: National Archives and Records Administration, 1982), roll 587; FHL microfilm 1,374,600. https://www.familysearch.org/ark:/61903/1:1:M2JN-FF1. 1920 Census, William R Hingston – Peabody, Exxes, MA (FS) ED 239, Sheet 8-B. “United States Census, 1920,” database with images, FamilySearch (https://familysearch.org/ark:/61903/1:1:MXY5­83B : accessed 12 March 2018), William R Hingston, Peabody Ward 1, Essex, Massachusetts, United States; citing ED 239, sheet 8B, line 59, family 155, NARA microfilm publication T625 (Washington D.C.: National Archives and Records Administration, 1992), roll 696; FHL microfilm 1,820,696. https://www.familysearch.org/ark:/61903/1:1:MXY5-83B. 1930 Census (FS), Family Search, William R Hingston – Peabody, Essex, Massachusetts. “United States Census, 1930,” database with images, FamilySearch: accessed 8 December 2017), William R Hingston, Peabody, Essex, Massachusetts, United States; citing enumeration district (ED) ED 228, sheet 2A, line 12, family 28,. https://familysearch.org/ark:/61903/1:1:XQLB-32P. “United States Census, 1940,” database with images, FamilySearch: accessed 9 December 2017), William R Hingston, Ward 1, Peabody, Peabody City, Essex, Massachusetts, United States; citing enumeration district (ED) 5-302, sheet 1B, line 67, family 22, Sixteenth Census of the United States, 1940, NARA digital publication T627. Records of the Bureau of the Census, 1790 – 2007, RG 29. Washington, D.C.: National Archives and Records Administration, 2012, roll 1588. Boston Herald (GB), Genealogy Bank, 1942-06-07, Page 49 – William Hingston – photo at the top of page. Man Hunt in Peabody. 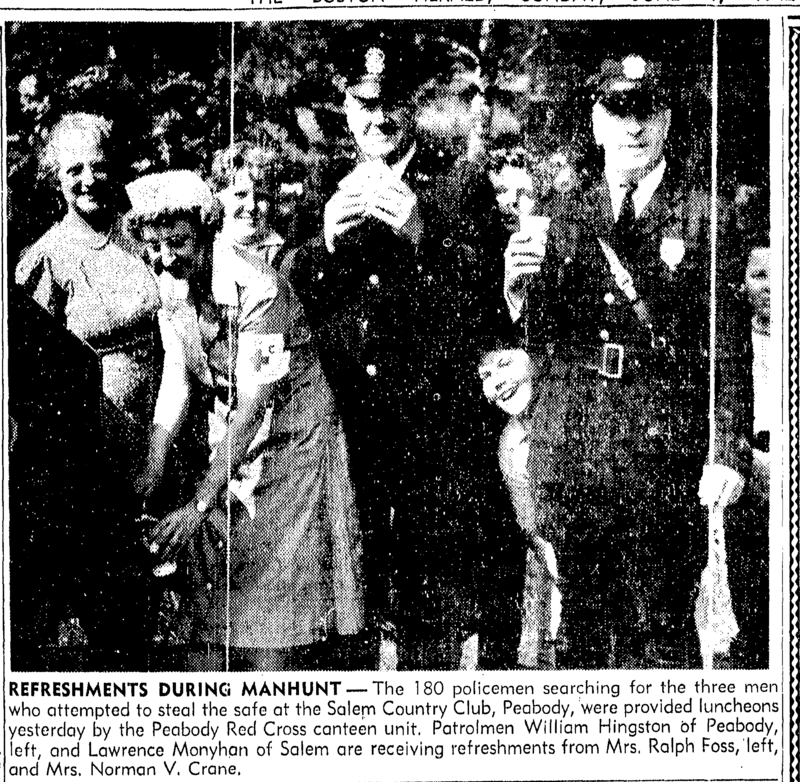 Boston Herald (GB), Genealogy Bank, 1954-02-09, Page 7 – Genealogy Bank Ex-Policeman Dies in Peabody, Fireman Aiding Him Collapses. Massachusetts Births, 1841-1915, Family Search, Barbara R. Hingston – 11 Sep 1914. “Massachusetts Births, 1841­1915,” database with images, FamilySearch (https://familysearch.org/ark:/61903/1:1:FXV1­VS4 : 11 March 2018), William R. Hingston in entry for Barbara R. Hingston, 11 Sep 1914, Peabody, Essex, Massachusetts; citing reference ID #p 721, Massachusetts Archives, Boston; FHL microfilm 2,409,800. https://www.familysearch.org/ark:/61903/1:1:FXV1-VSC. Massachusetts Marriages, 1841­-1915, Family Search, William R Hingston – Florence Reid – 24 Feb 1914. “Massachusetts Marriages, 1841­1915,” database with images, FamilySearch (https://familysearch.org/ark:/61903/1:1:N46B­91L : 18 January 2018), William R Hingston and Florence Reid, 24 Feb 1914; citing Peabody, Essex, Massachusetts, United States, State Archives, Boston; FHL microfilm 2,409,947. https://www.familysearch.org/ark:/61903/1:1:N46B-91L. Massachusetts: Grand Lodge of Masons Membership Cards, 1733-1990., American Ancestors, William Robert Hingston . Massachusetts: Grand Lodge of Masons Membership Cards, 1733-1990. Online database. org. New England Historic Genealogical Society, 2010. (From records held by the Grand Lodge of Ancient Free and Accepted Masons of Massachusetts.). http://www.americanancestors.org/DB410/t/12321/7849/138097453. Massachusetts: Vital Records, 1841-1910, American Ancestors, Line 111 – William Robert Hingston – Freke & Annie – Occupation Bleacher Ireland She was born in England. Massachusetts: Vital Records, 1841-1910. (From original records held by the Massachusetts Archives. Online database: org, New England Historic Genealogical Society, 2004.) Accessed 2018-03-14. https://www.americanancestors.org/DB191/i/10729/367/122175087. S. City Directories, 1822-1995, Ancestry.Com, Peabody, MA – 1919 – Page 197 – Hingston (A). Ancestry.com. U.S. City Directories, 1822-1995 [database on-line]. Provo, UT, USA: Ancestry.com Operations, Inc., 2011. Original data: Original sources vary according to directory. The title of the specific directory being viewed is listed at the top of the image viewer page. Check the directory title page image for full title and publication information. https://search.ancestry.com/collections/2469/records/517103230. S. City Directories, 1822-1995, Ancestry.Com, Peabody, MA – 1946 – Page 443 – Hingston. Ancestry.com. U.S. City Directories, 1822-1995 [database on-line]. Provo, UT, USA: Ancestry.com Operations, Inc., 2011. https://search.ancestry.com/collections/2469/records/510800033. S., Social Security Applications and Claims Index, 1936-2007, Ancestry.Com, Priscilla Ann Hingston (b. 1923) – No Image. Ancestry.com. U.S., Social Security Applications and Claims Index, 1936-2007 [database on-line]. Provo, UT, USA: Ancestry.com Operations, Inc., 2015. https://search.ancestry.com/collections/60901/records/19492049. “United States World War II Draft Registration Cards, 1942,” database with images, FamilySearch (https://familysearch.org/ark:/61903/1:1:V12F­STV : 9 March 2018), William Robert Hingston, 1942; citing NARA microfilm publication M1936, M1937, M1939, M1951, M1962, M1964, M1986, M2090, and M2097 (Washington D.C.: National Archives and Records Administration, n.d.).